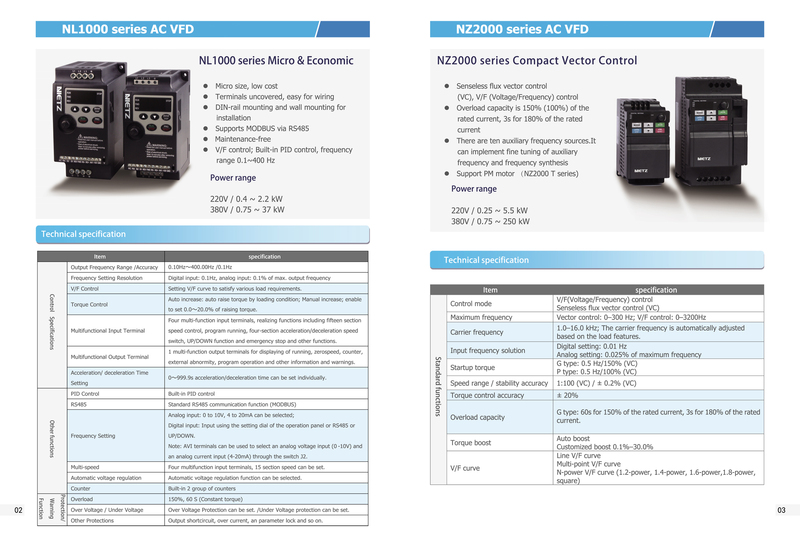 NZ2000 Series compact sensorless vector drive- Overload capacity is 150%(100%) of the rated current, 3s for 180% of the rated current; There are ten auxiliary frequency sources.It can implement fine tuning of auxiliary frequency and frequency synthesis. 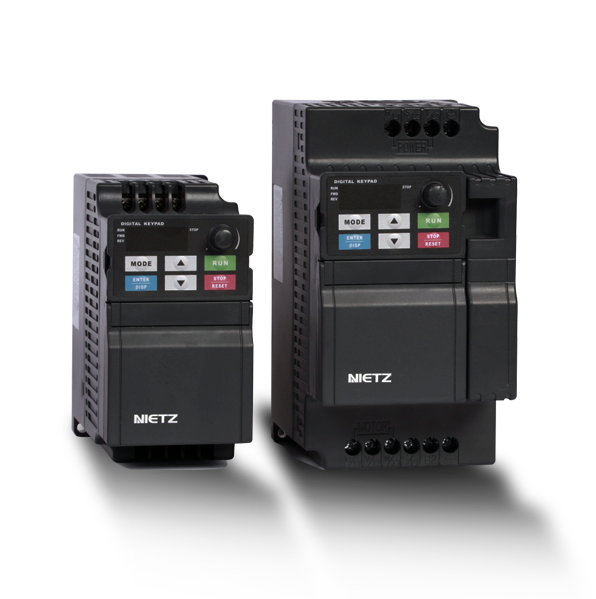 Two types of control mode: Sensorless flux vector control (VC), V/F(Voltage/Frequency) control.. The carrier frequency is automatically adjusted based on the load features. Overload capacity G type: 60s for 150% of the rated current, 3s for 180% of the rated current. P type: 60s for 120% of the rated current, 3s for 150% of the rated current. Onboard PID It realizes process-controlled closed loop control system easily. Auto voltage regulation (AVR) It can keep constant output voltage automatically when the mains voltage changes. Overvoltage/ Overcurrent stall control The current and voltage are limited automatically during the running process so as to avoid frequent tripping due to overvoltage/over current. Torque limit and control It can limit the torque automatically and prevent frequent over current tripping during the running process. Power dip ride through The load feedback energy compensates the voltage reduction so that the AC drive can continue to run for a short time. Rapid current limit It helps to avoid frequent over current faults of the AC drive. High performance Control of asynchronous motor are implemented through the high-performance current vector control technology. Protection mode Motor short-circuit detection at power-on, input/output phase loss protection, over current protection, overvoltage protection, under voltage protection, overheat protection and overload protection. Input and output Input terminal 6 digital input terminals, one of which supports up to 100 kHz high-speed pulse input. 2 analog input terminals, one of which only supports 0–10 V voltage input and the other supports 0–10 V voltage input or 4–20 mA current input. Frequency source Digital setting, analog voltage setting, analog current setting, pulse setting and serial communication port setting. Auxiliary frequency source There are ten auxiliary frequency sources.It can implement fine tuning of auxiliary frequency and frequency synthesis. You can perform switchover between these sources in various ways. operation on the operation panel LED display It displays the parameters. Key locking and function selection It can lock the keys partially or completely and define the function range of some keys so as to prevent mis-function. Environment Installation location Indoor, free from direct sunlight, dust, corrosive gas,combustible gas, oil smoke, vapour, drip or salt.